A desert tortoise lumbers in slow motion through the cactus forest, pausing occasionally to chew a sprig of grass. With its body shielded by armored plate, this critter seems more in keeping with dinosaurs and pterosaurs than with coyotes and kit foxes; a remnant of the prehistoric past. In fact, however, tortoises haven’t been around that long; they appeared just as the giant reptiles died out and the Age of Mammals began, about 65 million years ago. Tortoises haven’t changed much over the years. After gradually sprouting branches on the family tree, tortoise species are now found throughout the world; four of these species are found in North America. 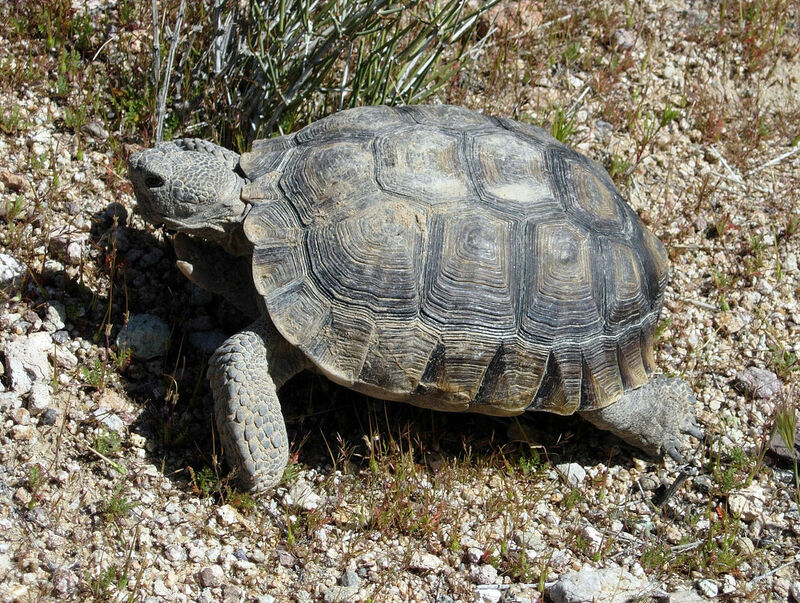 Two species – the desert tortoise and the Texas tortoise – descend from ancient lineage, and two others – the bolson tortoise and the gopher tortoise – are relative newcomers, dating back only 22 million years. The desert tortoise resides in the Mojave and Sonoran deserts of the Southwest. It sets up housekeeping almost anywhere between the sand flats and the rocky foothills, as long as there is food available and soil deep enough for it to dig burrows. This isn’t a massive tortoise; six to 14 inches is its usual size range. In the past, desert tortoises lived long enough to grow somewhat larger, but these are difficult times, what with a constant push and shove from modern man. Prior to the early 1950s, desert tortoise populations had reached a density of several hundred tortoises per square mile. Now they’re lucky to manage a modest five to 50 in the same area. Even more alarming is the creation of isolated populations. A tortoise rarely wanders more than a couple of miles from its birthplace throughout its long, lethargic life. When too many tract homes, roads, and irrigation ditches divide up the territory, individual populations may dwindle until their numbers are too small to be viable. First there are many, then few, then none. But what do tortoises do all day, other than racing the occasional hare? They eat, mostly. Grasses constitute the bulk of their diet, with a supplement of wildflowers, succulent leaves, and the odd cactus fruit. Their tastes are catholic, so they wander about, savoring a bite of this and a piece of that, and pausing frequently to rest and look around. Tortoise bodies are well adapted to living in regions that receive little rain. First, their scaly bodies and horny shells prevent much evaporation of water. Second, they satisfy most of their water requirement from moisture derived from the plants they eat. And finally, they drink copiously from a rain pool whenever one is available. Thanks to an extra-large urinary bladder, desert tortoises can store up to 40 percent of their body’s weight in water and then draw upon it in lean times. That is the primary reason you should never pick up a tortoise that you find in the wild. As a defensive measure, the animal usually voids urine, which is not too pleasant for either of you. Your shoes and pant legs smell, and the tortoise is now very vulnerable unless it can find water to refill its bladder. Next time, look – but leave the animal alone. The desert tortoise digs deep burrows in which it hides from summer heat and winter cold. Not so the Texas tortoise. That creature merely uses a series of pallets rather than going through all the work of digging. It may also hide out beneath a cactus clump or pack rat nest, or climb inside a burrow dug by some other animal. Obviously, this species should be more temperature tolerant than other tortoises, and scientific studies indicate that this is so. Studies also indicate something even more surprising – tortoises have their druthers about flowers. Red and blue seem to be their preferred colors, but no one knows why this is so. Unlike that of its North American cousins, the future of the Texas tortoise doesn’t appear to be threatened, even though at one time it was heavily exploited for the pet trade. The state of Texas began to regulate tortoise collecting in 1967, and it gave the animal full protection in 1977. The species seems to be doing well now. The opposite is true farther south, however. Found only in north-central Mexico, the bolson tortoise is the largest and the most threatened of the lot. Mexican campesinos claim to have seen bolson tortoises measuring more than a yard long and weighing up to 100 pounds. Whether individuals that large remain today is questionable, since no specimens even approaching those dimensions have been located. That is not too surprising, however, since members of this secretive species spend more than 90 percent of their time underground. Since all North American tortoises live in arid terrain, the fact that the gopher tortoise lives in the deep South seems a contradiction in terms. A desert in Florida, Georgia, Mississippi, or Alabama? In a sense, yes. In spots where deep sandy ridges remain from prehistoric beaches and dunes, the soil is deep and welldrained. Here the tortoises dwell. Millions of years ago, when the landscape was far drier than it is today, arid-land species such as the tortoise, the scrub jay, and the burrowing owl migrated eastward. As the seas rose and the climate changed, the eastern population became isolated on this desert “island.” Cut off from their relatives, they adapted or died. The gopher tortoise was named by an early European discoverer, presumably because it burrows like a gopher. However, the creature’s Latin name, Gopherus polyphemus, conjures up images of some kind of furry moth. So much for names. This animal’s digging ability really sets it apart. As do other tortoises, it has flattened but powerful forelegs. By rising on its stumpy back legs and digging away with the front legs, a 10-inch tortoise can dig a burrow 30 feet long and 10 feet deep that is air conditioned in summer and insulated against the cold during the winter. So attractive are those subterranean complexes that tortoises have a regular cornucopia of permanent or transient guests. Various birds drop into the burrow to avoid becoming a meal for a cruising hawk. Burrowing owls stay for an entire season. Snakes search the burrow for food, as do skunks, opossums, and armadillos. Rabbits, rodents, and amphibians check in and out. Add to that scores of insects and arachnids, and you end up with more than 100 different species of animals living in tortoise town. Loss of habitat is an even greater threat to the gopher tortoise. Agriculture and livestock grazing have taken their toll on these reptiles, as have real estate development and road construction. More than 80 percent of the original population has disappeared, and those that remain are clustered into small, isolated groups. If you want to see a gopher tortoise in the wild, you’d better find it soon. But that’s the negative side. If you want to do something positive, join the Gopher Tortoise Council or The Nature Conservancy in their efforts to set aside preserves for this declining species. What man has caused, he can try to correct. It’s not too late to save this relic of our prehistoric past.